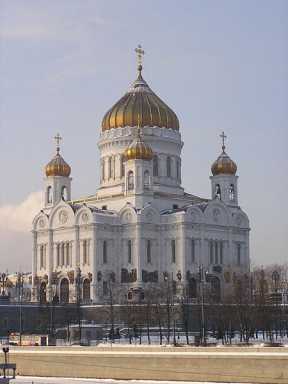 The Cathedral of Christ the Saviour is the tallest Eastern Orthodox Church in the world. It is situated in Moscow, on the bank of the Moskva River, a few blocks west of the Kremlin. 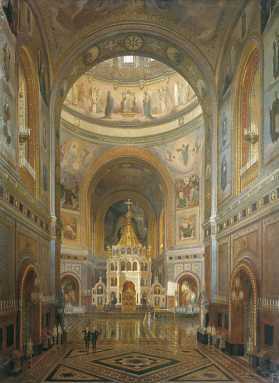 When the last of Napoleon's soldiers left Moscow, Tsar Alexander I signed a manifesto, December 25, 1812, declaring his intention to build a Cathedral in honor of Christ the Saviour "to signify Our gratitude to Divine Providence for saving Russia from the doom that overshadowed Her" and as a memorial to the sacrifices of the Russian people. It took some time for actual work on the projected cathedral to get started. The first finished architectural project was endorsed by Alexander I in 1817. It was a flamboyant Neoclassical design full of Freemasonic symbolism. Construction work was begun on the Sparrow Hills, the highest point in Moscow, but the site proved insecure. In the meantime Alexander I was succeeded by his brother Nicholas. Profoundly Orthodox and patriotic, the new Tsar disliked the Neoclassicism and Freemasonry of the project selected by his brother. He commissioned his favourite architect Konstantin Thon to create a new design, taking as his model Hagia Sophia in Constantinople. Thon's Neo-Byzantine design was approved in 1832, and a new site, closer to the Moscow Kremlin, was chosen by the Tsar in 1837. A convent and church on the site had to be relocated, so that the cornerstone was not laid until 1839. The Cathedral had taken many years to build and did not emerge from its scaffolding until 1860. Some of the best Russian painters (Ivan Kramskoi, Vasily Surikov, Vasily Vereshchagin) continued to embellish the interior for another twenty years. The Cathedral was consecrated on the very day Alexander III was crowned, May 26, 1883. A year earlier, Tchaikovsky's 1812 Overture debuted there. The inner sanctum of the church (naos) was ringed by a two-floor gallery, its walls inlaid with rare sorts of marble, granite, and other precious stones. The ground floor of the gallery was a memorial dedicated to the Russian victory over Napoleon. The walls displayed more than 1,000 square meters of Carrara bianca marble plaques listing major commanders, regiments, and battles of the Patriotic War of 1812 (with the lists of awards and casualties appended). The second floor of the gallery was occupied by church choirs. After the Revolution and, more specifically, the death of Lenin, the prominent site of the cathedral was chosen by the Soviets as the site for a monument to socialism known as the Palace of Soviets. This monument was to rise in modernistic, buttressed tiers to support a gigantic statue of Lenin perched atop a dome with his arm raised in blessing. On December 5, 1931, by order of Stalin's minister Kaganovich, the Cathedral of Christ the Saviour was dynamited and reduced to rubble. It took more than one blast to destroy the church and more than a year to clear the debris from the site. The original marble high reliefs were preserved and are now on display at the Donskoy Monastery. For a long time, they were the only reminder of the largest Orthodox church ever built. The construction of the Palace of Soviets was interrupted due to a lack of funds, problems with flooding from the nearby Moskva River, and the outbreak of war. The flooded foundation hole remained on the site until, under Nikita Khrushchev, it was transformed into a huge public swimming pool, the largest the world has ever seen. 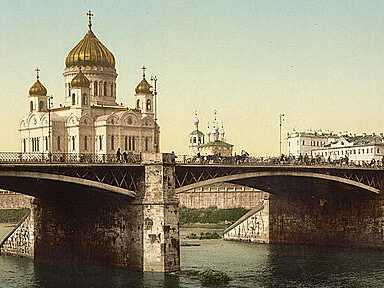 With the end of the Soviet rule, the Russian Orthodox Church received permission to rebuild the Cathedral of Christ the Saviour in February 1990. A temporary cornerstone was laid by the end of the year. 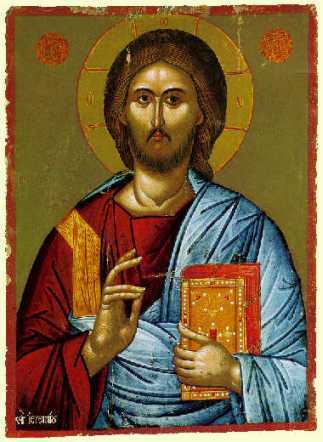 The restorer Aleksey Denisov was called upon to design a replica of extraordinary accuracy. A construction fund was initiated in 1992 and funds began to pour in from ordinary citizens in the autumn of 1994. When construction was well under way, Denisov was replaced by Zurab Tsereteli who introduced several controversial innovations. For instance, the original marble high reliefs along the walls gave way to the modern bronze ones, which have few if any parallels in Russian church architecture. 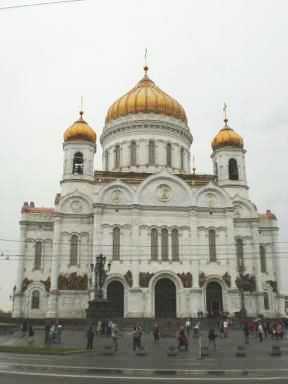 The lower church was consecrated to the Saviour's Transfiguration in 1996, and the completed Cathedral of Christ the Saviour was consecrated on the Transfiguration day, August 19, 2000. A pedestrian bridge across the river from Balchug was constructed between 21 June 2003 and 3 September 2004 (details, photo). On the slope of the hill to the right from the cathedral are the monumental statues of Alexander II and Nicholas II. The cathedral square is graced by several chapels, designed in the same style as the cathedral itself. Below the new church is a large hall for church assemblies, where the last Russian Tsar, and his family were glorified as saints in 2000. On May 17, 2007, the Act of Canonical Communion between the Moscow Patriarchate of the Russian Orthodox Church and the Russian Orthodox Church Outside Russia was signed there. The full restoration of communion with the Moscow Patriarchate was celebrated by a Divine Liturgy at which the Patriarch of Moscow and All Russia, Alexius II and the First Hierarch of ROCOR, Metropolitan Laurus, concelebrated the Divine Liturgy for the first time in history. The first Russian President Boris Yeltsin, who died of heart failure on April 23, 2007, lay in state in the cathedral prior to his funeral on Novodevichy Cemetery. This page was retrieved and condensed from (http://en.wikipedia.org/wiki/Christ_the_Saviour_Cathedral) see Wikipedia, the free encyclopedia, January 2008.